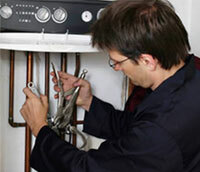 We offer a one day Training & Assessment package for completion of the Unvented Hot Water course. This course aims to educate operatives in order to comply with the Building Regulations (part G) and Water Regulations (WRAS). On completion of the course, candidates can join schemes to enable self-certification of installations in accordance with Building Regulations. The course is one day in duration and includes training and assessment. Our practical provision is second to none with hands on experience of several different manufacturer's equipment. The course is certificated by Logic Certification and upon successful completion, the candidate will be issued with a certificate and be eligible to notify installations via GAS SAFE REGISTER or any other approved scheme. The cost of this course is a: £160.00 (+ VAT) including course manual. PLEASE NOTE THAT THE COURSE COSTS CAN OFTEN BE RE-IMBURSED BY CYLINDER MANUFACTURERS (SUCH AS HEATRAE SADIA) UPON INSTALLATION OF ONE OF THEIR CYLINDERS!